We Love Jewelry. We Love Art. We Love the Process. We also realized that many of you have never gotten to see behind the curtain. So, we’ve decided to combine our loves and allow you to experience jewelry the way that we do. Our goal is to show you what we do in a photojournalistic style. We hope that you love these images and the story they tell as much as we love showing them to you. In this first series, we show the process of casting gold and platinum. Izzy preparing to smelt gold for a new custom design anniversary band. Izzy prepares to smelt gold. Due to the environmental impact of mining, Izzy and Terri’s preference is to use as much recycled gold as possible. This is one of the processes which set Atlanta Diamond Design apart from other jewelers in the Atlanta metro area. Casting platinum is an incredibly complex skill to master. Izzy has been doing it for over 30 years. Platinum is twice as dense as gold and needs a different casting process. Here you see the centrifugal forces in motion. This is literally the moment that the ring is formed. After the gold has become molten, it is poured into a cast with the assistance of vacuumed pressure. After the gold is heated to the point of being molten, it is poured into the casting and drawn in with the assistance of vacuum pressure. 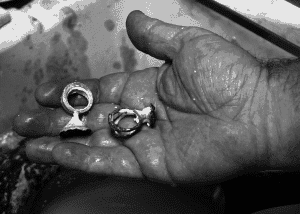 After the molten gold and platinum have been given time to take form, They are removed from the cast and seen for the first time. After being allowed to cool, the gold and platinum have taken their final shape and are removed from the ceramic casting. This is the first moment these rings have ever been seen. 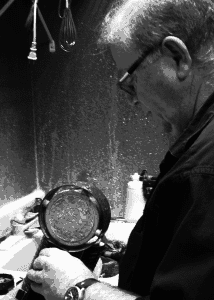 Izzy smelting platinum, preparing to cast a ring. Casting platinum is a technically difficult process and many areas of expertise that set Atlanta Diamond Design apart from other jewelers in the Atlanta metro area. Here, Izzy is smelting platinum to cast. This is one of the technically complex processes which makes Atlanta Diamond Design unique in the metro Atlanta area. Setting diamonds in a custom designed anniversary band. Here is a picture of the custom designed gold ring that was cast by Izzy in the previous images. It has been now polished and the diamonds are being set, soon to be delivered to our client.